Ed Walker's Stormy Antarctic beat highly fancied Foundation to capture the Craven Stakes at Newmarket. 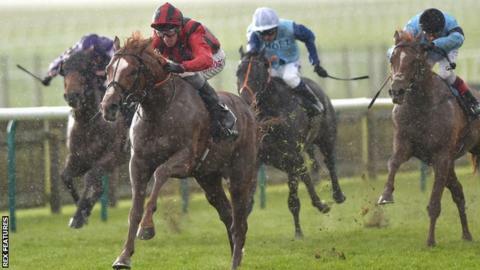 The mile race was a trial for the 2,000 Guineas at Newmarket on 30 April and three-year-old colt Foundation, ridden by Frankie Dettori, was 4-6 favourite. But Dettori could not find a push for the line and it was George Baker on board Stormy Antarctic who broke clear. The three-year-old chestnut raced home by three and a half lengths, his third victory in six races. Stormy Antarctic was narrowly beaten in a Group One in France last time out in November, and trailed to a steady pace set by Richard Hannon's horse Tony Curtis, who led by three lengths and was still in front inside the final furlong before eventually finishing fourth. Baker moved alongside Dettori before pulling away in a matter of strides and trainer Walker said: "That was awesome, I've always thought the world of him but I never thought he'd win a Craven like that and beat Foundation like that. "I've never had to prepare a Guineas horse and you only dream of horses like this, these are the reasons you get up at 4.30am, for horses like him. "I never felt we came here for minor honours and he is by far and away the best three-year-old I've got." Foundation's trainer John Gosden said: "Foundation is a mile-and-a-quarter horse, he did get tired on the ground but the winner won very well. "I'm delighted with him, and I'd like to think he'll go for the Dante [at York next month] next."